This is a very special recipe, one that has been highly requested and highly anticipated. In celebration of St. Patrick’s Day, I finally perfected my Best Ever Irish Scones recipe! These are the most authentic Irish Scones around as they are quite literally a revamped recreation of what I grew up with in Ireland similar to my Traditional Irish Soda Bread & Simple White Irish Soda Bread recipes. To me, scones are all about texture. My Best Ever Scones have all of the signs of what a scone should be: a crunchy, crackly exterior, a moist and dense interior and a lightly sweet flavor. Overall a bite of these should feel like a big hug! My Best Ever Irish Scones, along with my Best Ever Banana Bread and my Best Ever Chocolate Chip Cookies, are a tried and true recipe that will quickly become your go-to. Just like a flakey biscuit, scones are made of flour, butter, sugar, egg and milk. While these Best Ever Irish Scones taste like they are made in a real Irish Bakery, they are so easy to make. The key to them is really that they are made 100% by hand. In one bowl, I grate frozen butter into flour. This is the trick to making these the biggest and boldest scones. Grating the butter makes a huge difference in the texture of the scones; it creates pockets of butter throughout and adds loads of air and texture to the finished scones. What can I add to my Scones? After I grate in the frozen butter, I mix in the rest of the dry ingredients starting with sweet raisins and followed by the eggs and milk. This humble dough easily comes together by hand in minutes. At this point is when you can get creative and add in any other mix-ins you like. From adding fresh berries to chocolate chips, you can make so many variations with this recipe. Once the dough has come together, I roll the dough out and cut them into lovely rounds, only American scones are triangles. I can’t even tell you how nostalgic these scones are for me. After baking, I love to top these with jam and fresh whipped cream. If you happen to have my homemade Microwave Jam or clotted cream, even better! If you’ve ever wondered How to Make Clotted Cream you have to check out this my recipe! St. Patrick’s Day or not, these are sure to become a family favorite! Also, don’t miss my other traditional Irish recipes. With a lightly sweet crust and densely moist center, my Best Ever Irish Scones are a tried and true classic. Take it from an Irishwoman and chef! In a large mixing bowl, add self raising flour . Using a cheese grater, grate the butter in until it is all gone. (alternatively using a pastry cutter, cut/rub butter into flour until fully crumbed and resembles course breadcrumbs. Stir in raisins, baking powder and sugar. Cut scones out with a round 3 inch cookie cutter. Place cut scones onto a baking tray lined with parchment. Gather remaining dough in a ball, re-flatten then cut scones from dough. Repeat until entire batch of dough is cut into scones. If you have a little excess dough left, just pat it onto the top of the scones. Bake at 425oF (210oC) for roughly 22-26 minutes. In the video I said 12 minutes but to get them really golden brown you will want to bake for longer. Cool on wire rack. Serve warm or fully fully cooled with butter, jam, or fresh cream. BAKE TIME: . In the video I said 12 minutes but to get them really golden brown you will want to bake for longer. I ended up baking for over 20 minutes. This recipe is a winner. I did the previous best ever Irish scones, but this one is easier, and surpringly better. It’s been three days in a row that I am baking it. Everyone love’s it. YAY i’m delighted to hear that! I made these this morning for a brunch. Used your recipe for self-rising flour; had to make milk by combining heavy whipping cream with water AND, I used Lakanto Golden instead of regular sugar. They came out FANTASTIC. Everyone loved them. So light and airy. No one missed the sugar. I made a lemon curd to top them with….oh my! Hi, i don’t but that’s a great suggestion, thank you! Hi, i’m delighted to hear you’re going to give it a try! I dont have a Farls recipe but that’s a great idea! I made them and they taste good, but are more dense and doughier than I expected. I did add about 1/4 cup more sugar, could this have affected it? Also, it did not mix together as easily as yours, it was drier then too. I had self rising flour, but it was older, and I did add the baking powder in your recipe. I had to work it a bit to come together. Where did I mess up? Will try again, but not until I figure out where I went wrong. Also, they finished in 18 minutes, not 22. They would have burnt if I left them in. Hi there, it sounds like the ratio was off, i don’t know about adding more sugar here. If you do try them again, let me know how you go! Since the self-rising flour already has baking powder in it, is it still necessary to add the additional baking powder called for in this recipe? Thank you. Hi Gemma! I’ve made these scones several times,,turned out perfect every time. I love baking,at it all the time for my family. Just wondering I make the self raising flour,do I still need to add the extra baking powder that is posted in the recipe? I always add it. ❤️From Newfoundland! Hi, no you are correct, that’s the right amount. Enjoy! Hi wats the alternate to self rising flour plz tell . I just made and cut out the dough to be baked in the morning. Can I just keep them in the refrigerator instead of freezing them? Sorry I’m getting to your message late Mary Ann. You can keep them in the fridge for 2 days before baking. this is the best recipe yet 😍easy to follow great tips thank you. My tip; watch the baking time as all ovens are different. Yes, great tip, thank you! The general rule will be 2 teaspoons per 5 – 6ozs of plain flour. That is 2 teaspoon per cup according to my recipe. Then You can leave it at that, the extra in the recipe is to account for the pre-mixed one, which is not always reliable. For this scone recipe you would use 9 teaspoons as you say, not so confused after all, it is a large amount of flour. I love this recipe, the scones look delicious, I am definitely making these. I guess it would be best if I buy the self rising flour (I have all purpose flour) otherwise I would have to add a lot of baking powder to get the same results. I prefer to have all purpose flour, and add the baking powder as I need it. This means that my flour is always fresh, and so is the baking powder, and that matters! So, for every cup/5ozs/150g of flour add 2 teaspoons of baking powder. That will be slightly heaped, not overflowing spoons. Remember that your all purpose flour can also be used in my yeast baking recipes, so very useful to have to hand. Love this recipe. My first time making scones. I love how fluffy they are. I had to use whole wheat flour so I just added about 1/4 cup more milk. They tuned out gorgeous, and delicious. Thanks Gemma! Good on you! delighted you worked this well with the whole wheat flour, that can be a challenge with this type of bake, but adjusting the liquids would be a big help, well done. Thank you Gemma. They were delicious and my kids devoured them. I had to make another batch two days later and those went even faster. Hi Gemma, I’m definitely making these but I’m going to use buttermilk and a pinch of salt! Cannot wait. I even ordered the same blue scone cutter you used! Haha! you remind me of my mum! To quote her ‘I made that great recipe from —-, but I added, this, and that, and took out the other thing, it is a great recipe, you should try it’ lol, try what I say! Cup measurements are based on an informal system of measurement, prior to home weighing scales. People would share recipes based on their kitchen cups, it did not matter the weight of the ingredients, or the size of the cup, as long as the same cup was used to measure all of the ingredients, in any one kitchen. It a measure of volume. Once the balance is right, then all will be well. Different ingredients have different equivalent weights too, so rice will be different to sugar, cocoa to flour, and different flours will have a different weight too. Think Rocks and Feathers! So, the rule is simple, fill your cups in the same way, scoop/level/compress, however you choose, and the balance in the recipe will be good. It is not a good idea to mix cup measurements with another method, it is unnecessary, and will not be good for your recipes. You have to trust this system, if not, get a digital scales, it will be the most accurate of all! I though I had told you in plain words, I am sorry. It is as said here in the recipe. I give you the measurements for the US standard cup, according to how I load the cups, and the weights too to clarify. Cups are not the same everywhere, and how you load the cup affects the volume. Made these on Friday night, used chocolate chips and raisins. Came out beautifully. Very nice warm with good Kerry gold! Better the next day with butter and jam. Froze half a dozen for another time. Want to try clotted creme but can’t get it here in the US. , And can only find ultra pastured heavy cream here. Disappointing to say the least. But Gemma it’s a pleasure to bake your recipes. Delighted, you had a taste of my home with your Kerrygold! Yes, freezing the remainder is always a great choice, they defrost quickly too, so ready to warm when you have unexpected visitors. Depending on where you live in the US of course, you should be able to get Heavy Whipping Cream, in the dairy cabinet, near the milk in your store. The fat content should be shown on the back of the carton, 35% fat content is ideal. I hope you try this, it is a delicious treat! 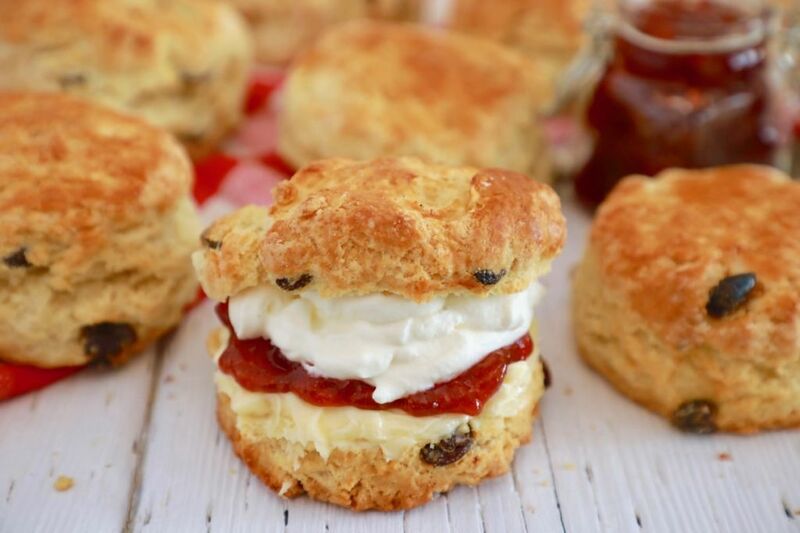 I am making your clotted cream recipe along with these scones and I wondered how I should use the leftover liquid from the clotted cream in this recipe? Should it be substituted entirely for the milk? Or maybe just partially? What will be best for the taste/texture of the scones? Thanks!! Is there an adjustment needed for high altitude? Hi, i might just bake them for 5 minutes less. Enjoy! I hope you posted some posted of those. They sound beautiful! I hope you had a lovely Valentine’s Day! There is no salt in the recipe and none in your self raising flour recipe. Will it affect the scones if I add any or should I just leave it out? Hi there yes you can add it in. can I use rice milk? Hi, yes you can. Enjoy! 120 gm of fat per scone? Is that right ??? Hi, its 170g for the entire batch. I hope that helps, enjoy! Can we do an eggless version of these scones? Hi there, you can use a flax egg here instead. Looking forward to trying your recipe.I plan to make my own self raising flour and the recipe calls for an additionl 3 tsp baking powder, is this correct? Also the recipe calls for MILK. Can I make my own buttermilk and use that? I live in Colorado which calls for high altitude bAking. What should I add to the things that bake? Hi there, for this you might just want to cut bake times down by 5 minutes or so. But it will vary depending on the recipe. Can I substitute the milk with buttermilk because still left some after making butter and I have already tried out your biscuit which is so yummy? Hi, yes that will work here. Enjoy these! My kids doesn’t like raisins so can I change it to chocolate chips or cinnamon instead of raisins? If yes, how much should I add and do i need to reduce the sugar in the scone recipe? I like your recipe, all so basic and great taste especially your tiramisu. All my friends and family love it so much. Hope you have a wonderful and awesome weekend! I am delighted to hear that 😀 you can reduce the sugar if you like by a few tablespoons. You can add the same amount of chocolate instead of the raisins. Enjoy! very wet? which ever way. I use them frozen, and yes, they bleed a little into the scone dough, but in a good way! This is true of other berries too. Strawberries not so much as they are so large. Blackberries/black currants/red currants etc work really well. I certainly will I can then assume that putting frozen fruit in the scones wii keep them moist? I use frozen fruit! yes, they bleed a little into the scone dough, but in a good way! This is true of other berries too. Strawberries not so much as they are so large. Blackberries/black currants/red currants etc work really well. Give it a go! Help Gemma! Can I use frozen fruit in these rather than raisins? Or, Craisins? Yes you absolutely can use frozen fruit or craisins. Every dried cherries and chocolate would be lovely. Your scones recipe looks delicious..I will make them..but too are looking for more healthy options. But as you say we could try coconut oil….but will it be the same! Hi, i am delighted to hear you enjoy them! Yes, that will work here too. My scones came out perfect and delicious! Thank you first recipe that truly comes out as you state it seems other ones out there leave something out but yours excellent. I made cinnamon chocolate chunk scones my family loved them. Delighted to hear you had success, Tina!! Thanks for trying them out. Hi Gemma. Do you have any low-fat scone recipes? Don’t get me wrong, this recipe looks great, but I’d like something a little bit more streamlined in terms of fat and calories. Hi there, i do not at this time, but if you want you can replace the butter with coconut oil or ghee for a healthier fat. Enjoy! I’m baking these for the first time today with my daughter who loves scones. Just curious…I’m not at all opposed to baking and eating sweets or treats in moderation, and want to ask if you can clarify the amount of total grams of fat per scone – it says 120g – which seems high to me, especially in relation to the amount of calories, which is 376 and that sounds typical. Thank you! The fat content is high as this recipe utilizes quite a lot of dairy. It comes from the butter, the buttermilk and the eggs.